Very sharp and platy Chalcocite crystals with a black color and blue metallic reflections. They are on a rock matrix with small white Calcite crystals. A classic from Kazakhstan, each day scarcer. 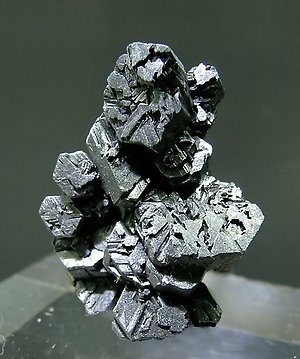 Group of very sharp Chalcocite crystals that are twinned, partially doubly terminated and very bright. The sample is from an exceptional find from which only very few were saved. 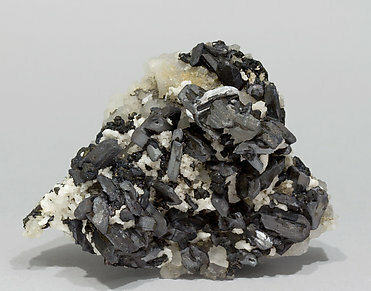 Good sample, very representative of the material from the Flambeau Mine, a classic for the species. 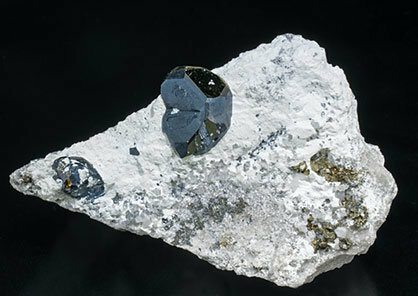 The crystals, on matrix, are sharp and have very well defined faces and edges, showing the metallic bluing characteristic of the samples from this mine. These old timers have that special touch. While it may not be as attractive as some other specimens the difficulty in getting material from this mine and the patina that time has given the crystals make it a nice classic. 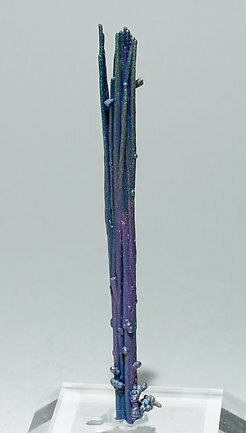 An especially interesting miniature. The sharp crystals, with very well-defined faces and edges, form a very aerial parallel growth. 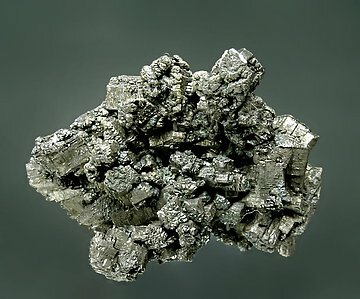 The crystals are quite well-developed for this mineral species and they form a very aerial group, which has not been altered or coated in this fine sample. A novelty at Tucson 2014. 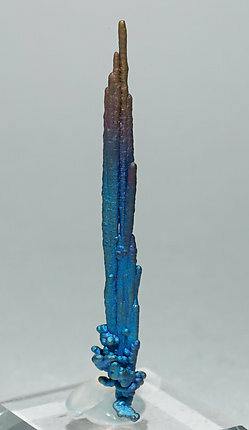 Aggregate of extraordinarily elongated Chalcocite crystals completely coated by iridescent Chalcopyrite, with dominant blue shades. 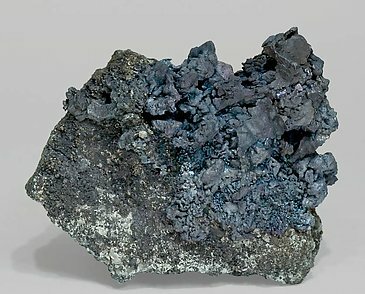 By recent reports, it seems that in some cases the Chalcocite crystals are partially replaced by Djurleite. A novelty at Tucson 2014. 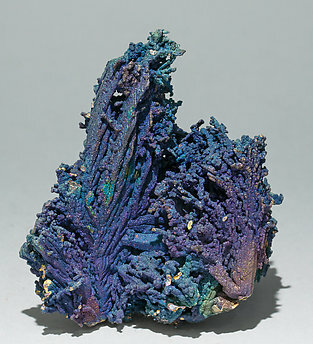 Aggregate of extraordinarily elongated Chalcocite crystals and coralloid growths completely coated by iridescent Chalcopyrite, with dominant blue and violet shades. By recent reports, it seems that in some cases the Chalcocite crystals are partially replaced by Djurleite. A novelty at Tucson 2014. 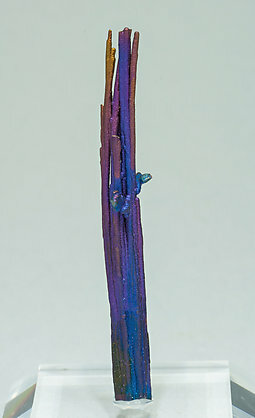 Aggregate of extraordinarily elongated Chalcocite crystals completely coated by iridescent Chalcopyrite, with dominant blue, violet and golden shades. 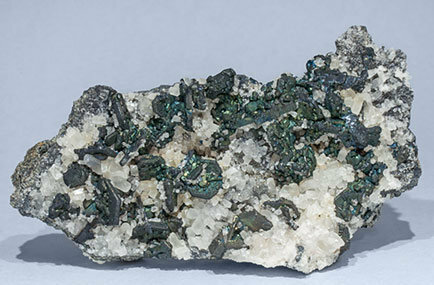 By recent reports, it seems that in some cases the Chalcocite crystals are partially replaced by Djurleite. A novelty at Tucson 2014. 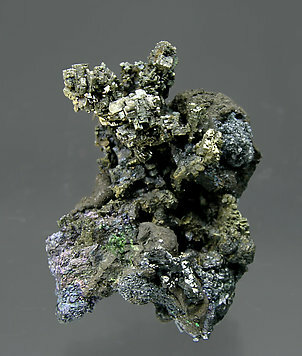 Aggregate of extraordinarily elongated Chalcocite crystals completely coated by iridescent Chalcopyrite, with dominant green and violet shades. 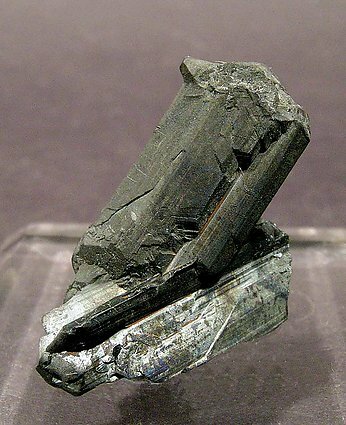 By recent reports, it seems that in some cases the Chalcocite crystals are partially replaced by Djurleite. A novelty at Tucson 2014. 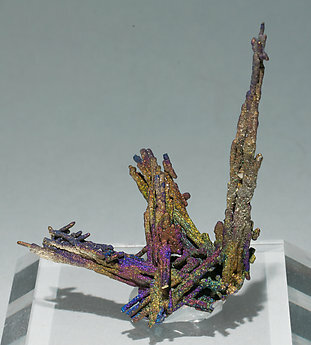 Aggregate of extraordinarily elongated Chalcocite crystals completely coated by iridescent Chalcopyrite, with dominant violet and golden yellow shades. 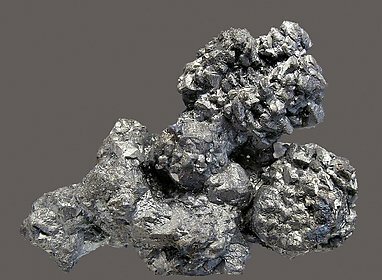 By recent reports, it seems that in some cases the Chalcocite crystals are partially replaced by Djurleite. A novelty at Tucson 2014. 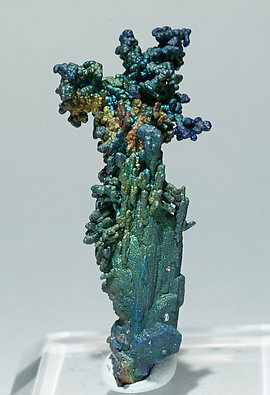 Aggregate of elongated Chalcocite crystals with very well defined faces and edges finished with an arborescent growth and completely coated by iridescent Chalcopyrite, with dominant blue shades. 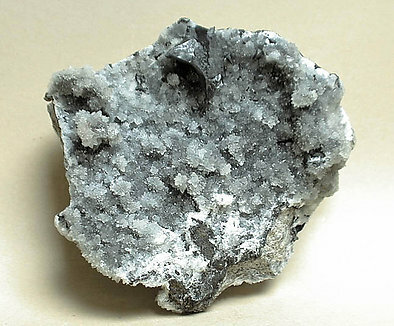 By recent reports, it seems that in some cases the Chalcocite crystals are partially replaced by Djurleite. A novelty at Tucson 2014. 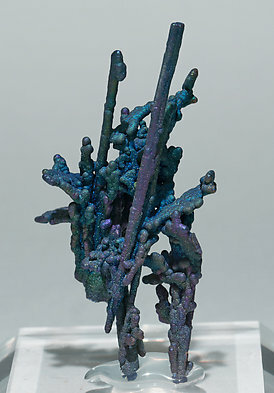 Aggregate of extraordinarily elongated Chalcocite crystals and arborescent growths completely coated by iridescent Chalcopyrite, with dominant blue shades. 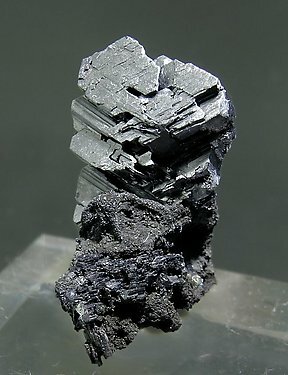 By recent reports, it seems that in some cases the Chalcocite crystals are partially replaced by Djurleite. A novelty at Tucson 2016 (but found in 2013). 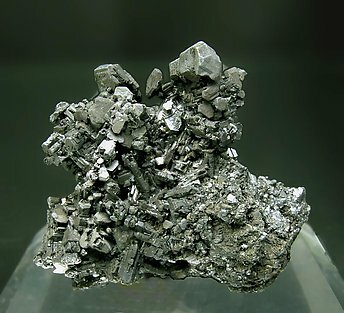 Complex Pyrite crystal, very rich in faces that are black colored due to a uniform Chalcocite coating, very bright and on matrix, with small (not coated) Pyrite crystals. Skeletal growths of Chalcocite, acompanied by parallel aggregates of small Bornite cubic crystals. Excellent classic miniature. Group of prismatic crystals of very well defined faces and edges. Excellent classic miniature. Group of tabular pseudohexagonal crystals of very well defined faces and edges. 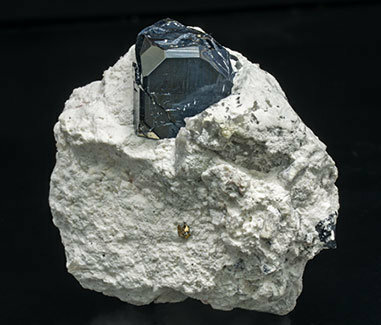 Single and very sharp Chalcocite crystal with very well defined faces and edges, bright and on matrix, with acute scalenohedral Calcite crystals. The sample is from the Silvane collection whose label we’ll send to the buyer. 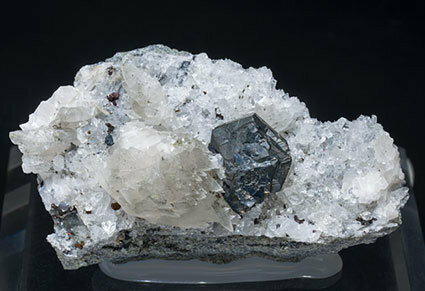 Very well defined and flattened crystals, many of them doubly terminated, bright and on matrix, with small Calcite crystals. Again, something extremely unusual from Martín. 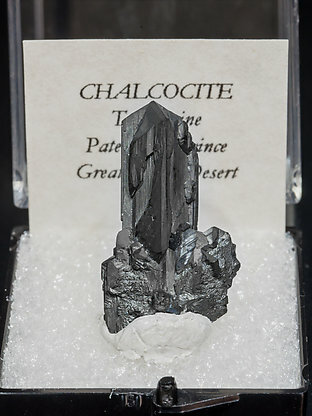 This well formed Chalcocite which is aerial on the Calcite matrix comes from Chile. On Oliete's label the location is written as being Chuquicamata. After hard investigations about Chilean mineral localities I'm able to tell that it must came from Copiapó and I'm also able to say that I have never seen anything similar in my life and I'm sure that not too much other people have either. Well, it is good, sharp and extremely original.